Pragmatic Play presents a tribute to a majestic African giant in Great Rhino. 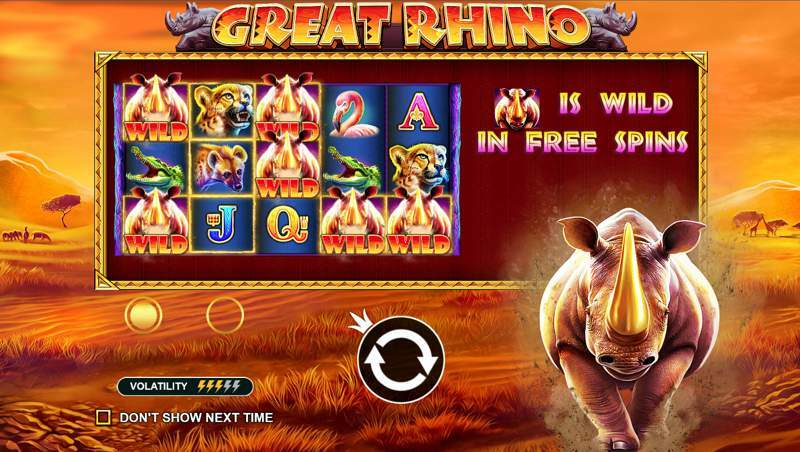 The African rhino has roamed the African plains for millions of years, and this slot game theme honours this admirable existence with exciting features like the Super Re-spin and free spins for prizes of up to x500 total bet! Close your eyes and picture yourself in the African plain with the desert heat blowing in your face and the smell of fresh, open air. The plain is the home of the rhino and the backdrop for the slot where you’ll be blown away with the vivid colour and artwork. The exceptional creativity extends to the symbols which can be separated into the upper-value and lower-value spectrum — the former consist of a mighty rhino, speedy cheetah, stealthy crocodile, opportunistic hyena and majestic pelican. The latter consists of the A, K, Q and J poker symbols. Matching the incredible artwork is the equally incredible African tribal music which is inspired and coupled with sporadic audio effects of native animals that round out the slot nicely. The rhino poker chip wild symbol can substitute for all others except the bonus scatter symbol. What’s more, this wild can combine exclusively to reward coin prizes of x0.2, x2.5, x7.5 or x25 total bet. The Acacia scatter may appear on the middle three reels, and if you manage to land all three in any position, then the ten free spins feature is triggered. A reward of x2 total bet is instantly credited before the commencement of the free spins. During the free spins, the rhino symbol becomes a wild replacing all the other symbols and adopts the rhino poker chip wild paytable. During play we found the free spins feature very difficult though not impossible to trigger. The Super Re-Spin Feature is unlocked with at least two full stacks of rhino symbols which are subsequently frozen in place for three free re-spins. During this feature, only rhino symbols are present and can appear on the reels to lock in place while awarding an additional free re-spin. It is only when no re-spins remain that your final win is calculated. In this way, it is possible to unlock the Major Jackpot of 375x total bet if you manage to collect 14 rhino symbols or 500x total bet with the Grand Jackpot if you manage to collect 15 rhinos. This feature is not available during free spins. As with the free spins feature, we also found this feature difficult to trigger. Great Rhino slot has an RTP of 96.53% and a range of bets starting from the 0.20 and ending at 100. It is rated as medium volatility, 5-reel and 20 fixed paylines slot which is available on pc, tablet and mobile. If you find yourself roaming the range down in Africa, then know that you can take the game with you using your Android or iOS device. 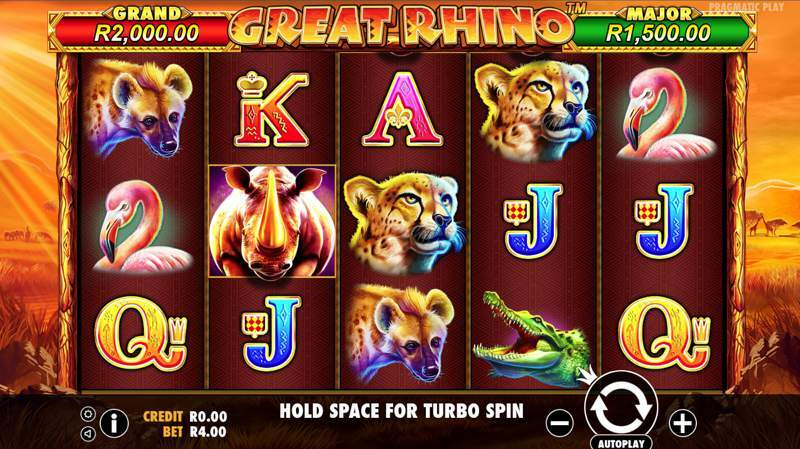 Great Rhino is an excellent African themed slot game featuring the endangered Rhino.